Opening Remarks: Let me first start with the injuries that we know of. Wayne Gallman is the only guy that got hurt yesterday, a knee, so we’ll just see where he’s at. He’s questionable moving forward. I don’t really have much to add in terms of starting us out that I didn’t talk about last night. I think the film played out the same way today, we didn’t have really any new looks at things that we didn’t see on the field. I thought our guys played hard front to back, I think it’s safe to say – and you might ask me about individual players, but I think the guys all had a lot of good plays; but we all had mistakes that we need to clean up, players and coaches alike. That’s the process you go through really every week, but especially after the first week as we get ready to play Dallas. With that, I’ll try to answer your questions. Q: Will you give anybody else (first team) reps in practice this week at right tackle? A: We actually rotate the guys during the week, so there are guys that get practice there. As you know, we kept seven guys up, so we rotate through there. Q: Did you contemplate yesterday during the game moving (Ereck Flowers) at any point? A: Like I said, he’s like every player. I think I know where you’re going with this, he’s like every player. He had a lot of really good plays and he had a couple that he’d like to have back. Q: He got turned around a lot, especially on that first drive with the tripping penalty. A: He had the tripping penalty and then on the hold, and that happens frequently, the quarterback scrambled, which was good, and unfortunately there’s times when those holds occur. That was the gist of it the first drive. Q: Do you have enough time in this week to get him improved before Dallas based on what the film showed? A: He’s like every player. Again, he had a lot of really good reps and he had a couple he’d like to have back. He’s going to work to get better just like every player. Q: What went into the two-point conversion call going right back to (Saquon Barkley) after his big run? Q: Do you have concern when guys come off of a really long run? A: No. Saquon is a well-conditioned athlete. Q: The fact that he was off the beginning of the next drive had nothing to do with that? Q: Late in the game, you said yesterday you had not thought of Odell returning a punt late in the game. You obviously needed a big one, why didn’t you consider that? A: Especially in that situation, I mentioned I didn’t because we were going for the block. Typically in that situation, the returner knows there’s a decent chance you might fair catch it. He (Kaelin Clay) did have a little more space than you normally have, he just misfielded it. Q: Will you consider putting Odell back there moving forward)? Q: What would go into (that decision)? Q: Is there a danger to an offense being too reliant on big plays? A: No. You like to create big plays, we want explosive plays within our offense. I’ve said it all along, when the score is like that, we didn’t have as much success early running the ball as I would’ve liked, but I want to continue to call runs. You never know when a big one’s going to pop up like that. That’s what happened there. Q: Sometimes you are just waiting and waiting for one to come along. A: No, we’re trying to create them. We threw the ball down the field quite a bit actually, and we also threw some intermediate throws that we had success with. We had some concepts that were working. Again, I thought we did some good things against Jacksonville, but we need to do more things better. Q: What’s your mindset? Do you feel like we did enough good things where we’re close or we did too many wrong things? A: We just need to get better all the way around. That’s safe to say. Really, you make mistakes when you win games, so you go through the same process every Monday of trying to highlight the areas that need to get better and you work on them. That’s it. Q: What did you think of (Eli Apple)? A: I thought he played a really solid game. He was competitive in coverage, made a couple plays on the ball, and I liked it. It was a good opening game for him. Q: Do you feel like you tried to get Saquon involved in the passing game early? It seems like getting him the ball in space would be one way to create those big plays. A: We tried getting him the ball in some areas that they took it away down the field, so some of the crossing routes showed up. Yeah, we tried to get him the ball throwing it, running it, and we found a way to get one big play out of it. Q: After watching the film, what was your takeaway from the offensive line? A: Again, I thought they all had some really good plays and they all had some mistakes that we’ve got to clean up. A: In the passing game, it seems 15 throws to one guy (Odell Beckham Jr.) is an awful lot. Is that because he was simply getting open, or that’s the way the progressions were going? A: That’s the way the progressions were going. Fifteen shots to Odell. I think we might be here some day when he doesn’t get that many and you’re saying, why don’t you throw it to him 15 times? Again, every snap was not man and so there were some progression-related throws where, on a couple of those underneath throws to Odell, the initial read was maybe Saquon would run a wheel route. It just happens that way, and ideally, all the eligible receivers should get touches. I think that’s an important way to play offense, because I trust all the guys that are out there to make good catches. Q: Do you put up video clips of positive plays for the guys after games, like (Sterling Shepard’s) block, for example, on Barkley’s (touchdown) run? A: Yes, we cover everything. We do. We watch all the tape. The offense gets together and watches all the tape, defense watches all the tape, they’ll do it in their individual meetings, and we do it in team meeting settings. We watch it. Q: What did you think of the mental state of your team today? How did they handle everything that happened yesterday? A: I thought they were very professional. We came in and we talked about the things that went right, the things that went wrong, we talked about our approach moving forward, and that’s what we’re doing. Q: What kind of a tone did you want to set (after the first loss)? A: I’ve been involved in a lot of first games of the season – won about half of them, and lost about half of them. You just move forward. That’s the important thing is you move forward. You learn from the mistakes you made, you build on the things you did well and you just keep moving. That’s the important piece. That may get old as we go through these Mondays with me saying that, but you can win a game and still go through that process. When you lose a game, it hurts more, but you still go through the same process. Q: We know the quality of the opponent you were going against, especially defensively. How do you balance being realistic and knowing that what you did against them, but also not fall into the trap of, ‘well, that was a great team, so now we’re not going to see a defense like that the next week and the following week’? A: It’s a great question, and it’s one of the things we talk about frequently. You don’t get to go in our weight room, but it’s everywhere. We don’t make excuses or let other people make them for us, and that’s letting other people make them for us when we say, ‘well, we played a good opponent.’ Everybody’s good, and we expect to go out and win every game, so we don’t factor that in. Q: Back to Ereck Flowers at right tackle – what would you have to see to rotate someone else in there? A: We’re just going to try to get better. As you know, I’m fond of our roster. I’m fond of our offensive linemen. Ereck had a lot of really good plays yesterday, so what we’re going to do is try to help him with some of the technique work that he can improve on, just like every player, to eliminate some of those mistakes. You just keep working with him, and then we always rotate guys through in the event that we have injuries. You don’t see that, but that happens. Q: I meant on a Sunday, to rotate someone in there, or to maybe use someone else there. A: We’ll see. Right now, what we’re doing is trying to get every player better. I’ll probably say it for the 10th time now, he had a lot of plays that were really good. The Giants have lost seven out of their last eight home openers. 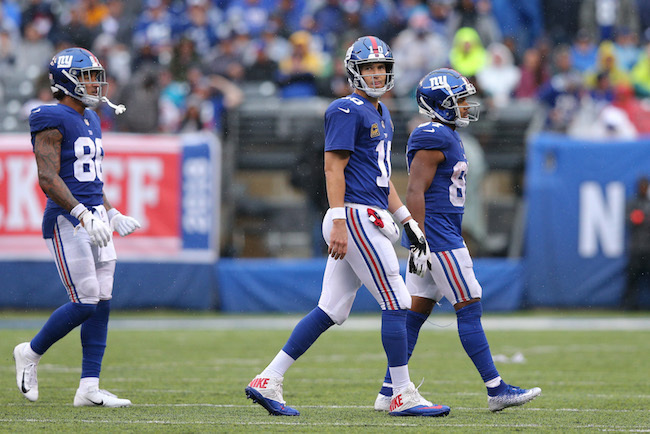 Quarterback Eli Manning set a franchise record by playing in his 217th regular-season game in a Giants uniform, breaking a tie with former Giants defensive end Michael Strahan. Manning became the fourth player in team history to play 15 years with the franchise, joining Strahan, center Mel Hein (1931-45), and quarterback quarterback Phil Simms (1979-93). Manning became the fifth quarterback in NFL history to start at least 14 consecutive season openers with one team. The others include Tom Brad, Brett Favre, John Elway, and Dan Marino. Running back Saquon Barkley is the first Giants back to run for at least 100 yards in his NFL debut. Barkley was the first Giants rookie running back to start a season-opening game since Sean Bennett in 1999. Wide receiver Odell Beckham has eight games with at least 10 receptions. He has 20 games with at least 100 yards.